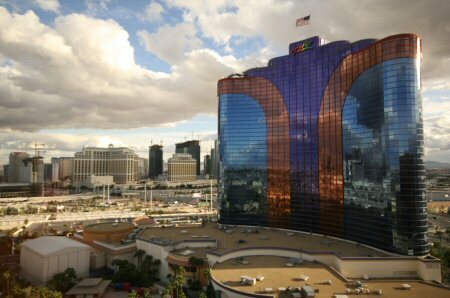 The view from my room at the Rio is slightly different to last time, but still very cool. This time it’s the 18th floor of the Ipanema tower, which means that the main thing you can see is the Rio’s other tower, which glows magnificently – even under these dark winter skies. It’s a very narrow angle looking North through the window but I can see the strip from Bellagio (on the left in the shot above) right down to Encore. I’m sure there will be more photos to follow.